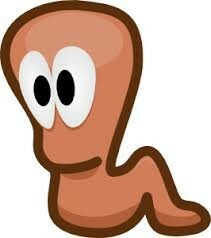 Earthworms generally live in soil. Earthworms play a major role in the conversion of large pieces of organic matter into rich humus, improving soil fertility. They are eaten by birds, moles, ants, scorpions, and other various large insects. Earthworms are decomposers so they feed on dead organic matter and excrete into the soil, making it richer. They have a double transport system composed of coelomic fluid. They also have a closed circulatory system. Food enters the mouth. 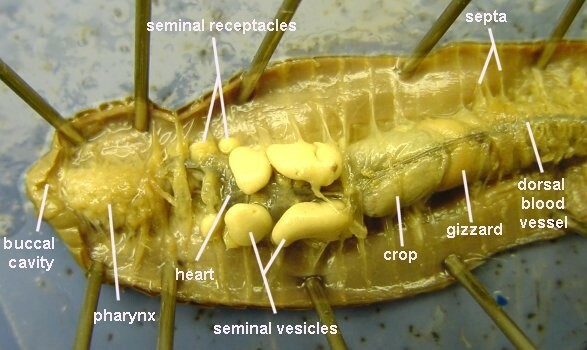 The pharynx acts as a suction pump; its muscular walls draw in food. 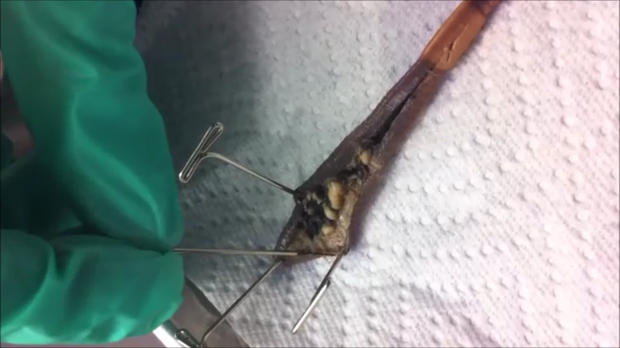 In the pharynx, the pharyngeal glands secrete mucus. Food moves into the esophagus, where calcium (from the blood and ingested from previous meals) is pumped in to maintain proper blood calcium levels in the blood and food pH. From there the food passes into the crop and gizzard. In the gizzard, strong muscular contractions grind the food with the help of mineral particles ingested along with the food. 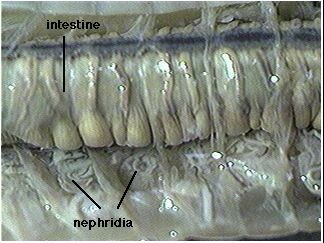 Once through the gizzard, food continues through the intestine for digestion. 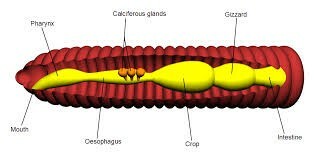 The intestine secretes pepsin to digest proteins, amylase to digest polysaccharides, cellulase to digest cellulose, and lipase to digest fats.The worm’s excretory organs are tiny nephridia. There are two in every segment.